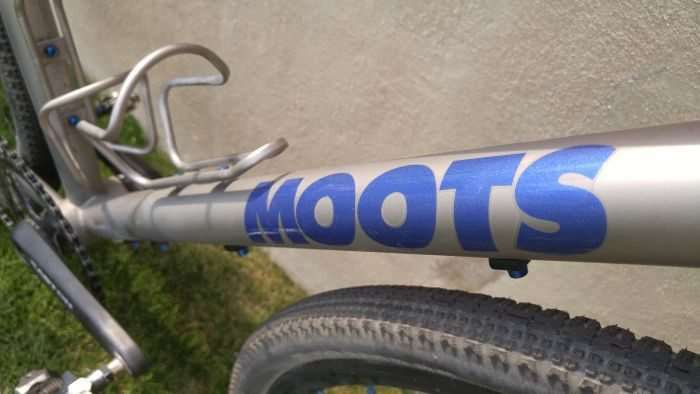 The very first Moots, a custom steel road frame, rolled out the front door in Steamboat Springs, Colorado, in 1981. This example of the Moots Routt RSL belongs to Jeremiah Gantzer, the gentleman responsible for Moots sales in the Midwest and Rocky Mountains regions of the United States. This bike isn’t all show and no go. 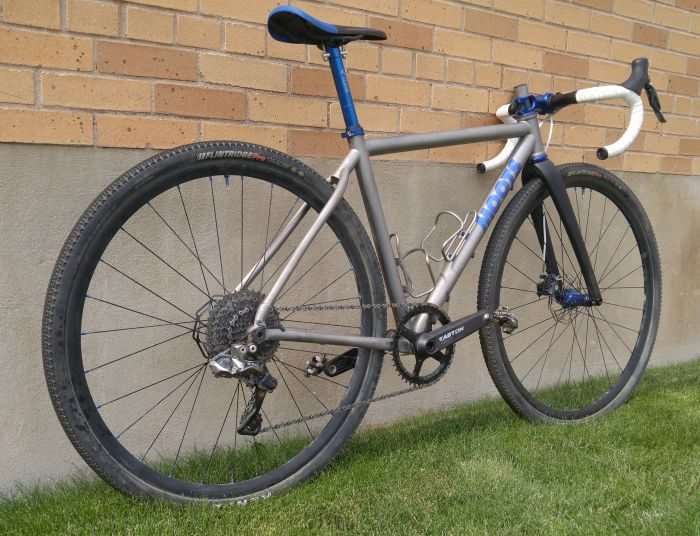 Jeremiah raced this lovely machine at the recent Crusher in the Tushar in Beaver, Utah. Working for a company such as Moots has its perks. 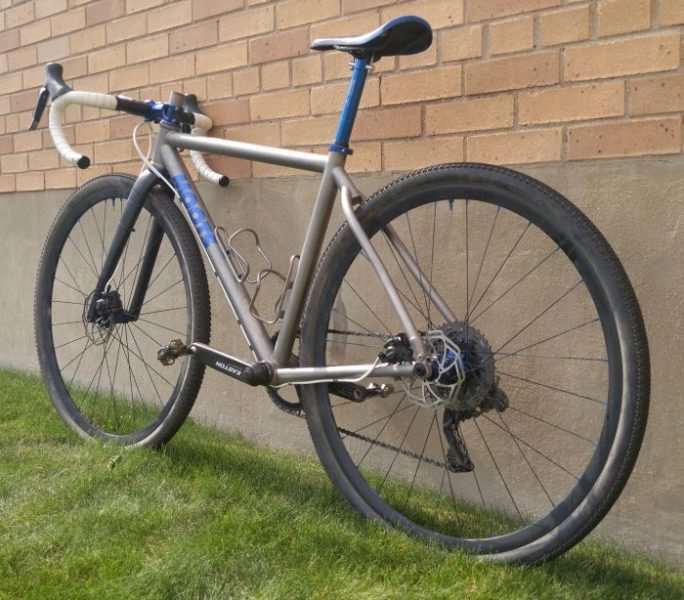 Rather than sticking with the headtube badge that adorns every Moots frame that departs their Steamboat Springs facility, Jeremiah requested the company logo be engraved into the headtube – all in the name of saving a few grams. Tricky. 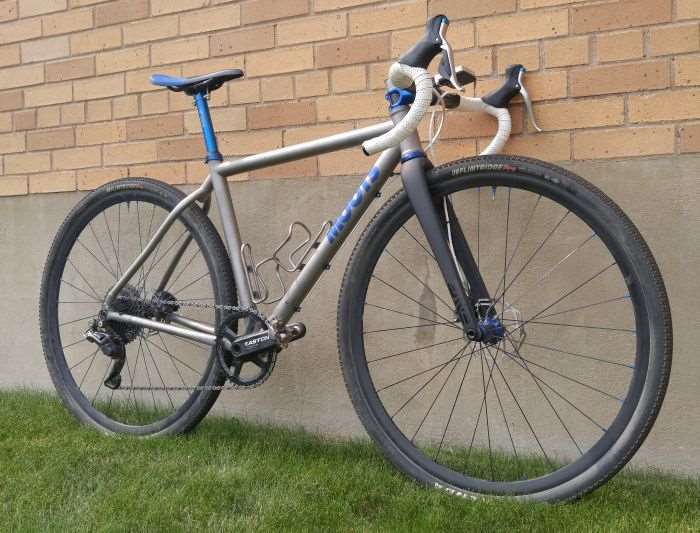 Jeremiah has carefully chosen parts for his Moots that are both lightweight and durable. 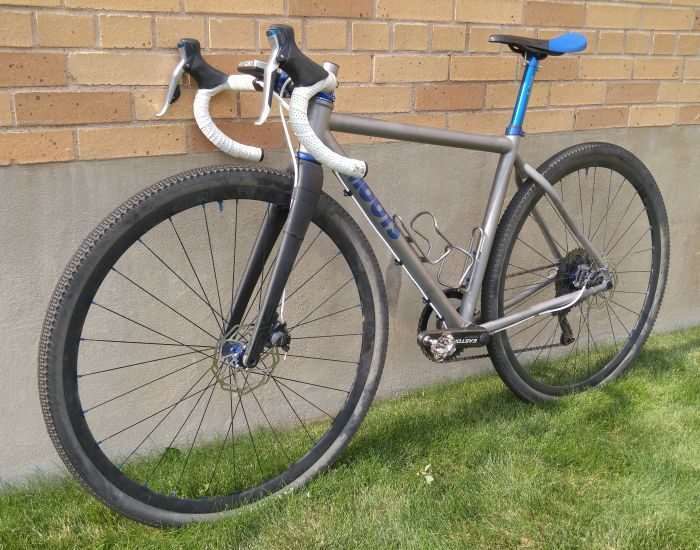 Jeremiah’s bike relies on a 1X XTR Di2 drivetrain (more photos below), and has selected the rarely seen Shimano Alfine Di2 shifters. 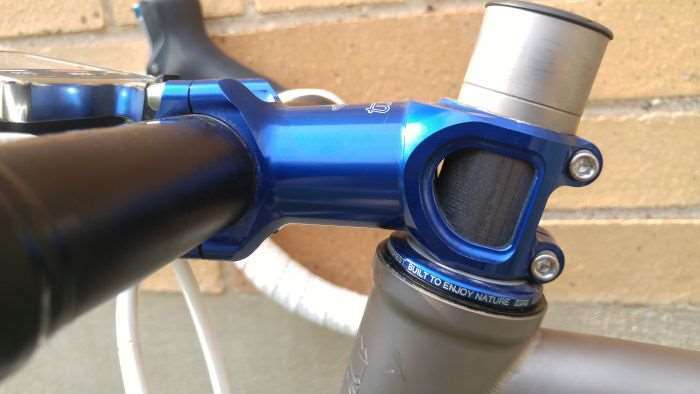 With just one functioning shifter lever required, Alfine Di2 levers are a good choice if you’re looking to save a few grams on a 1X drivetrain, and don’t have a requirement for hydraulic brakes. 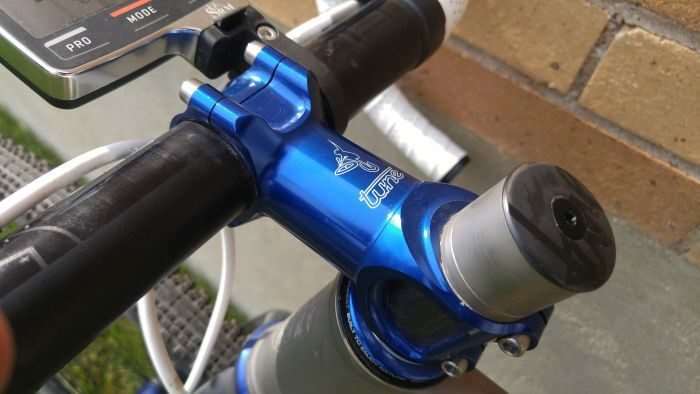 Shimano’s Alfine Di2 levers are for mechanically actuated brakes only. Jeremiah informed me he’ll be upgrading to Shimano Dura-Ace 9170 Di2 levers in the future – for a few more weight savings. 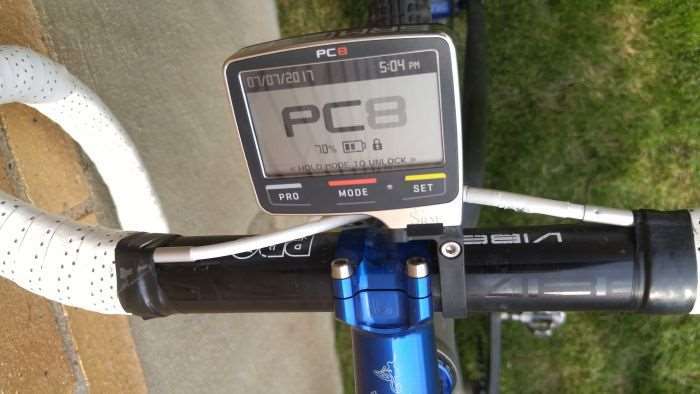 The venerable SRM PC8 head unit mates wirelessly to the Easton crank based power meter. Lightweight parts from German manufacturer Tune are all over Jeremiah’s bike. 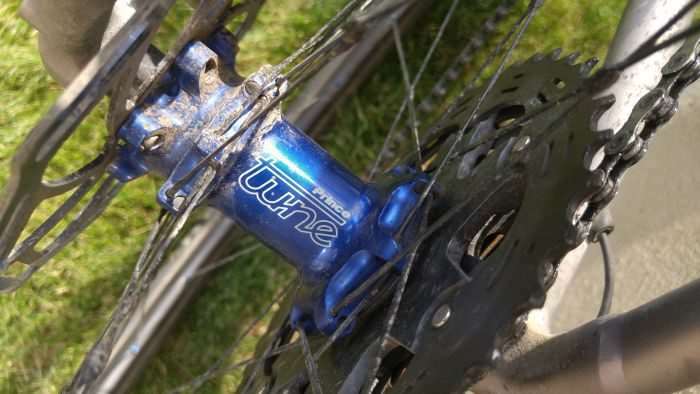 Above, a Tune Babo headset is matched to a -17 Tune Geiles Teil 4.0 stem. “Geiles Teil” literally means “Horny Piece”. 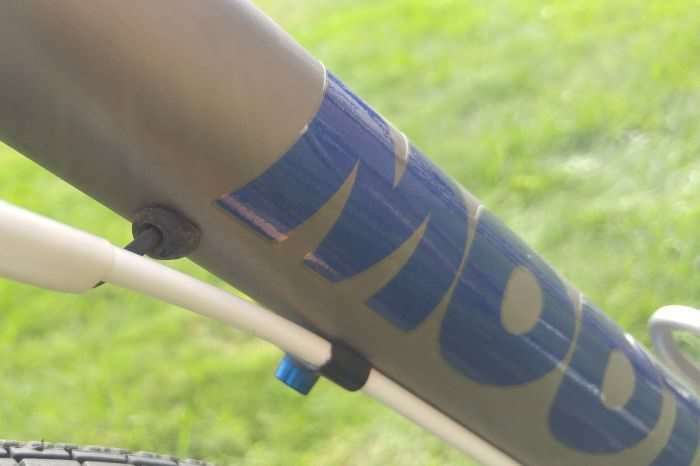 The anodized blue of the Tune parts contrast nicely with the bead blasted finish of the Moots titanium frame and white handlebar tape. 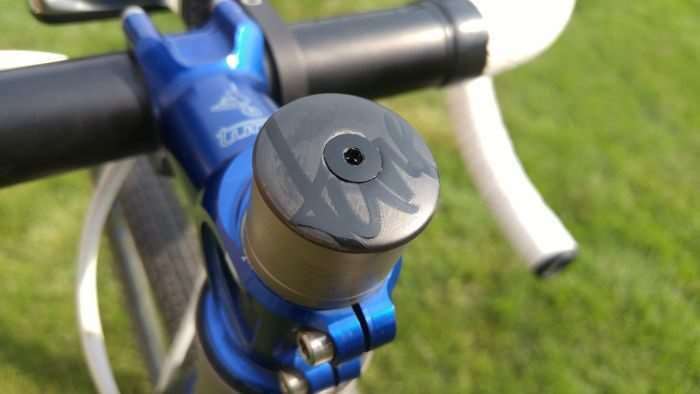 More gram chasing – The Tune Deckel (headset cap) + Schraube (aluminium bolt), a combination that weighs a paltry five grams. Hidden beneath these two items, inside the fork steerer tube is the Tune Gum Gum. The Gum Gum is Tune’s ultra lightweight fork / steerer expander. 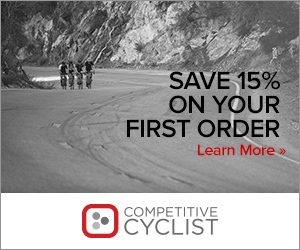 The trickery continues, this time with Di2. This is a very recent addition to Shimano’s Di2 product line, the EW-RS910 Junction A box. Rather than being slung beneath the stem, this version of the junction box resides inside the end of one’s handlebar. 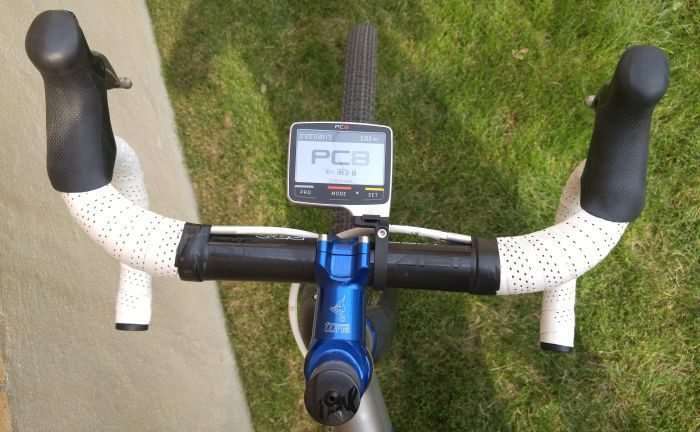 If you look at the photos above, you won’t see any Di2 wiring present around the handlebars. 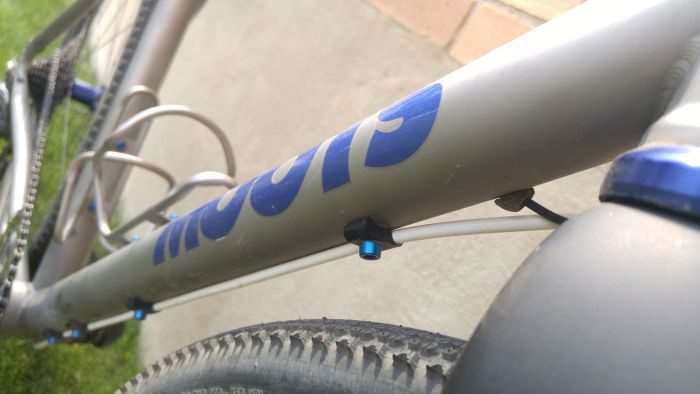 The wire from the EW-RS910 unit is routed discreetly inside the handlebar, and exits through a port on the bar beneath the handlebar tape. Then, Jeremiah uses the pro-mechanic trick of heat shrink tubing to hide the Di2 wiring. 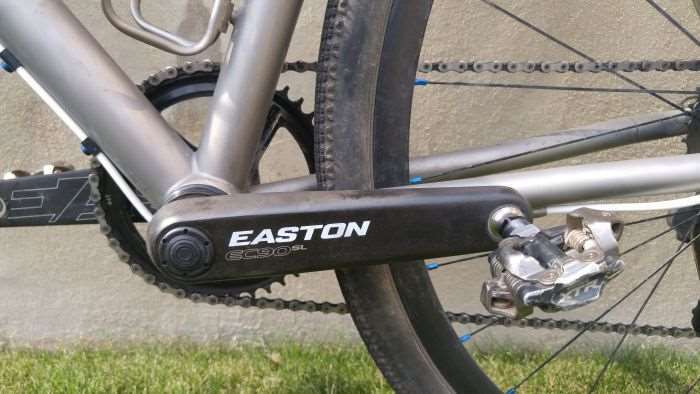 Power measurement is handled by Easton’s EC90 SL crankset, which utilizes the company’s Cinch technology (30mm bottom bracket spindle). 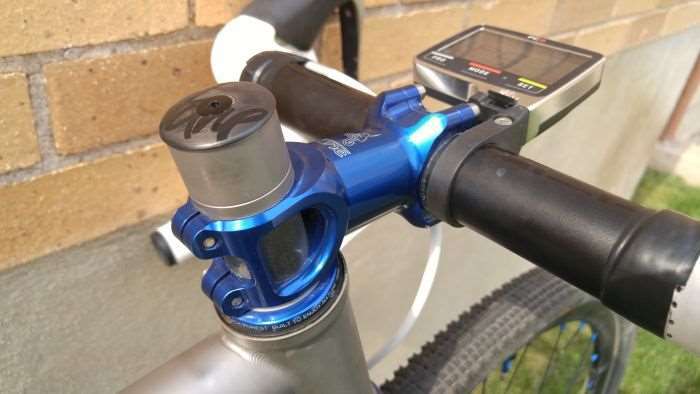 In addition to the new Cinch power measuring spindle, hidden away from view, the crankset can be setup as a 1X or 2X. In Jeremiah’s case, he has chosen 1X and a 44 tooth chainring, which is directly mounted to the crankset. Pedals are Shimano’s ultra reliable XTR PD-M980 pedals. 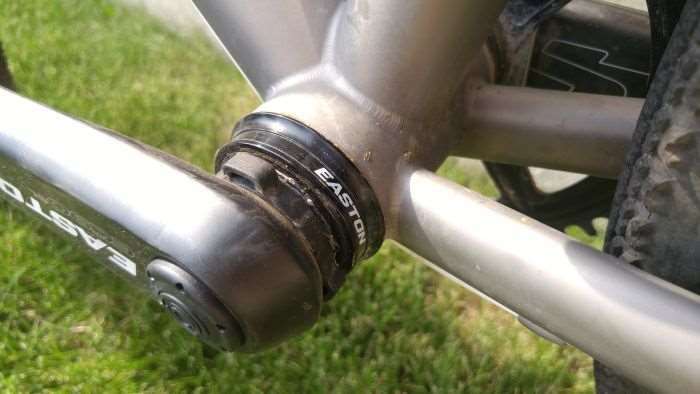 Above, Easton PF30 compatible bottom bracket. Shimano’s superb XTR Di2 rear derailleur handles the chores of shifting. 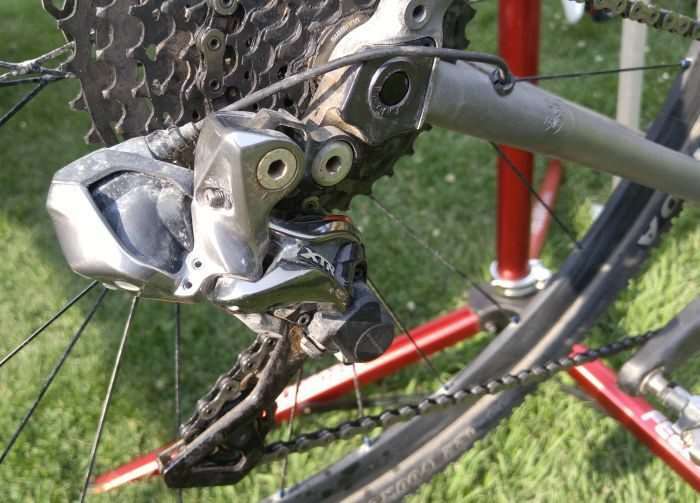 Unlike the road versions, this derailleur is fitted with a clutch, for handling the nastiest of conditions. Di2 wiring is routed inside the right chainstay. 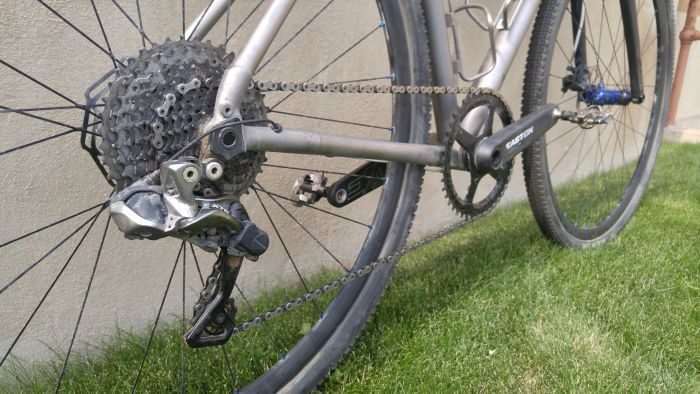 Shimano XTR 11-speed 11-40 cassette. 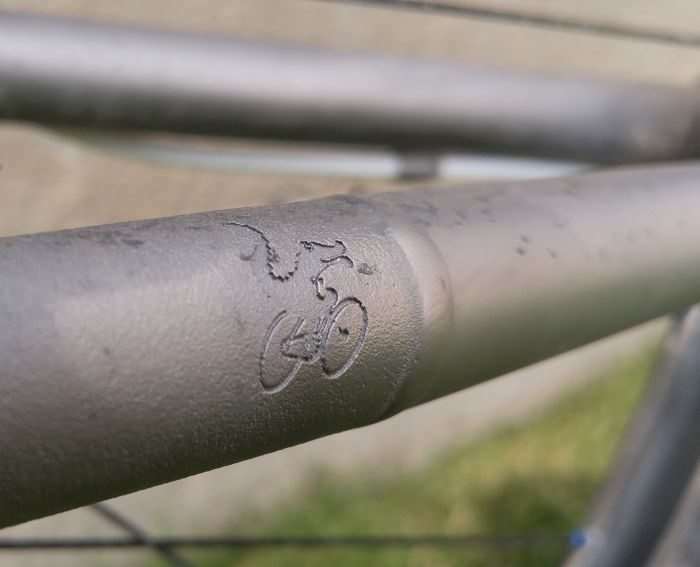 Great attention to detail in the chainstay – the Moots logo is engraved – and a little weight is saved. 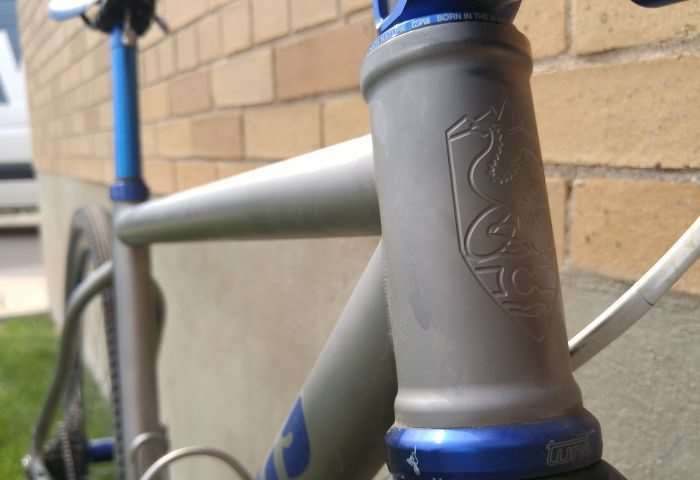 A titanium frame should always be fitted with the best bottle cages going – King Cage Titanium – these cages never eject bottles, and the variant sold by Moots is bead blasted, providing a perfect match to the frame. The rear mechanical brake cable is routed cleanly beneath the frame’s downtube. Note the anodized blue aluminium bolts. Above, one of the few places Di2 cabling can be spotted on this bike. Hidden beneath the heat shrink tubing, the cable enters the frame and is run internally towards the bottom bracket area. 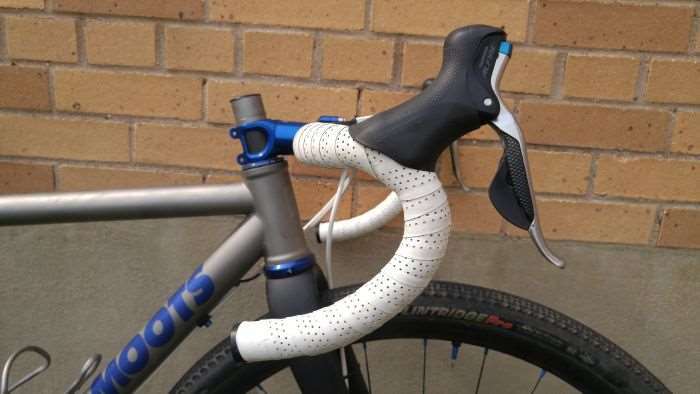 Above, an Enve all carbon tapered fork. Enve fork with the rarely seen Shimano BR-RS350 flat mount mechanical disc brake. These calipers are a single piston design, but offer plenty of braking power. 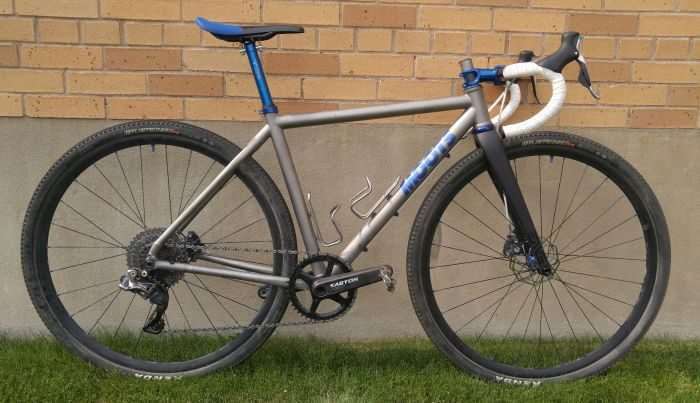 Tune’s 6-bolt rotors in 140mm, fitted with titanium bolts, help bring Jeremiah’s Moots to a halt. The wheelset on Jeremiah’s bike is very special. The stock build is very light at 1,370 grams the pair, but this pair of Tune Skyline road disc wheels have been further tweaked, to reduce the weight to 1,150 grams for the pair! 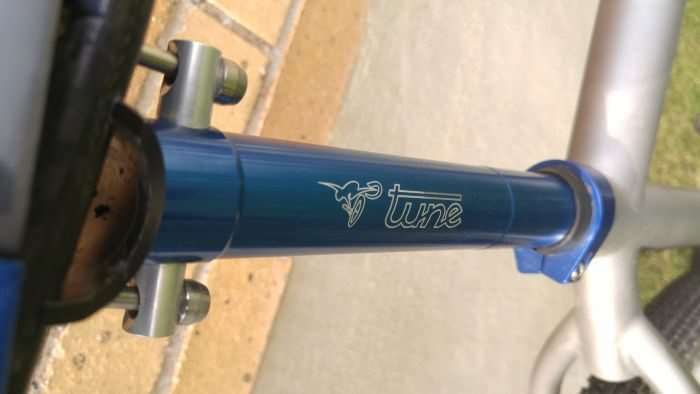 Tune’s Princess Skyline hub and straight pull spokes are featured on the front wheel. 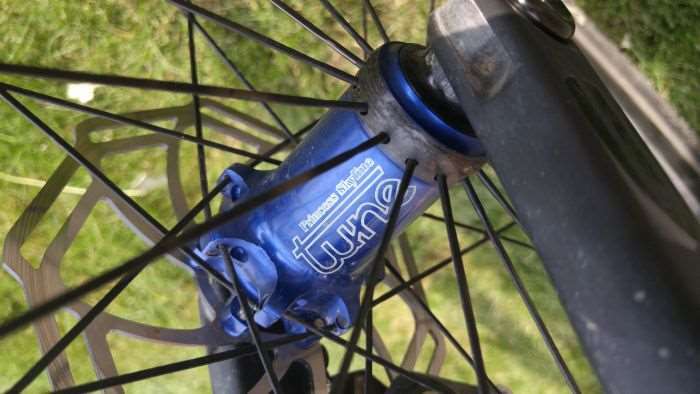 On the rear, Tune’s Prince hub. To ensure these lightweight wheels remain relatively stiff and stay round and true, the spokes are carbon wrapped where they cross. This is an improvement upon the old trick of tying and soldering spokes. 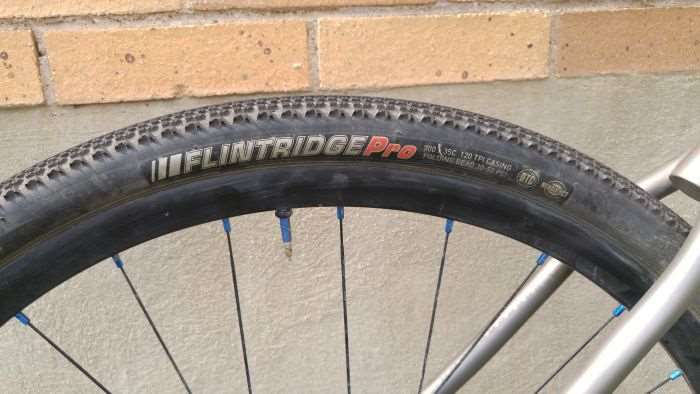 Kenda’s Flintridge Pro tyres are tubeless compatible and feature a 120TPI count. The Routt RSL frame will clear a 700c x 40mm tyre. 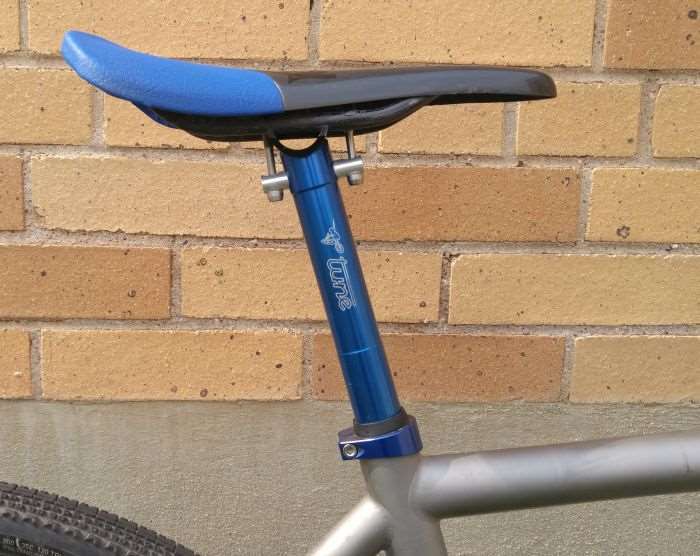 More attention to detail with the blue anodized seat collar and engraved Moots logo. A USE 30.9mm – 27.2 shim downsizes the 27.2mm Tune seatpost to the Moots. Above, a zero setback Tune Starkes Stück seatpost. 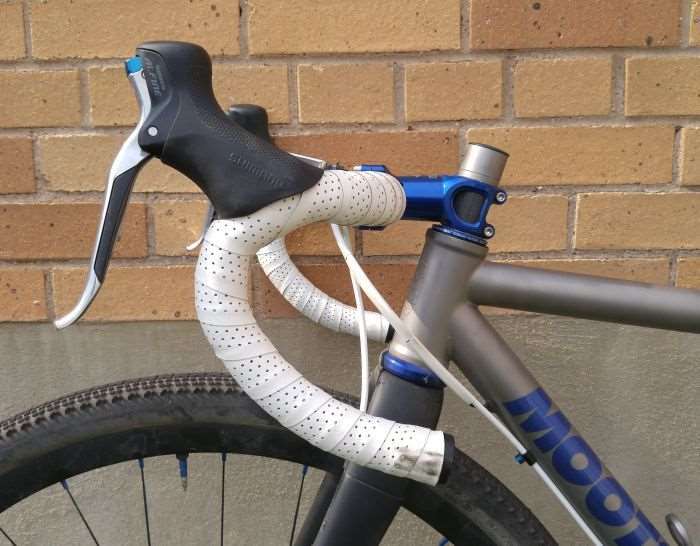 This seatpost features titanium bolts and a carbon fiber support cradle. Jeremiah perches upon the Tune Komm-Vor saddle. The lightweight leather padding and full carbon fiber construction adds up to 95 grams. Don’t judge a book by its cover – this and saddles like the Tune are extremely comfortable. Remember, modern shorts feature plenty of padding, so saddle padding can be skimped upon if you’re serious about saving weight. 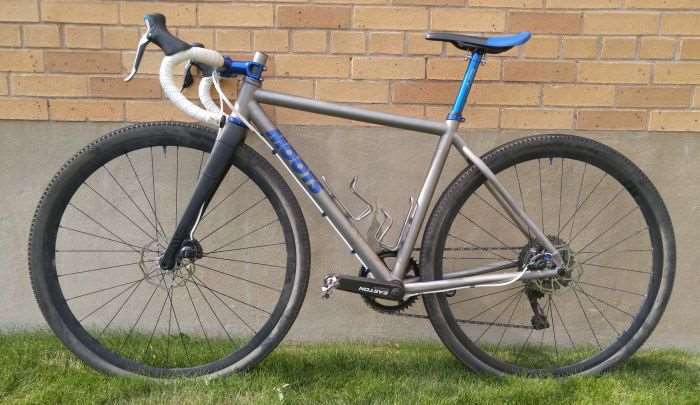 Frame: Moots Routt RSL, custom machine on the headtube. Fork: Enve Cross Fork Disc, 12mm thru-axle. Stem: Tune Geiles Teil 4.0 stem. 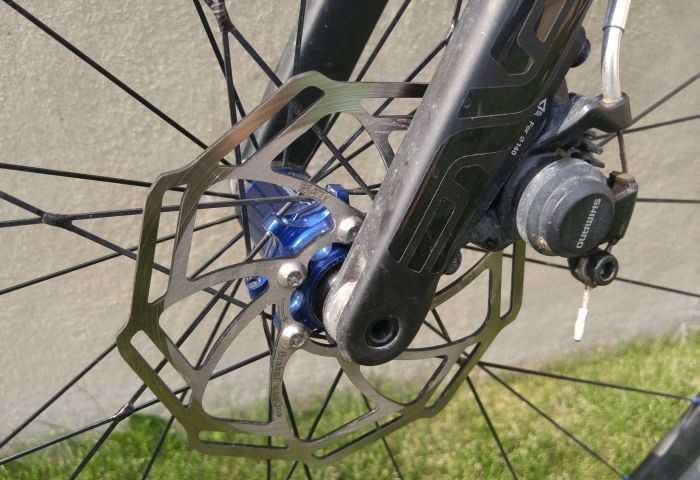 Brakes: Shimano BR-RS350 flat mount mechanical disc. 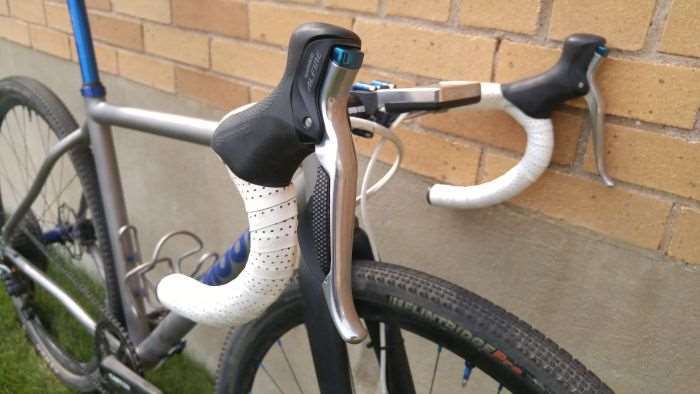 Brake / Shift Levers: Shimano Alfine Di2. 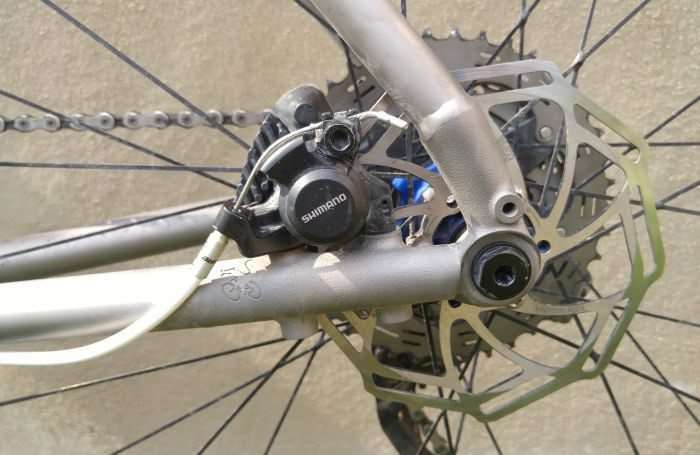 Rear Derailleur: Shimano XTR Di2. Cassette: Shimano M9000 11-speed 11-40. 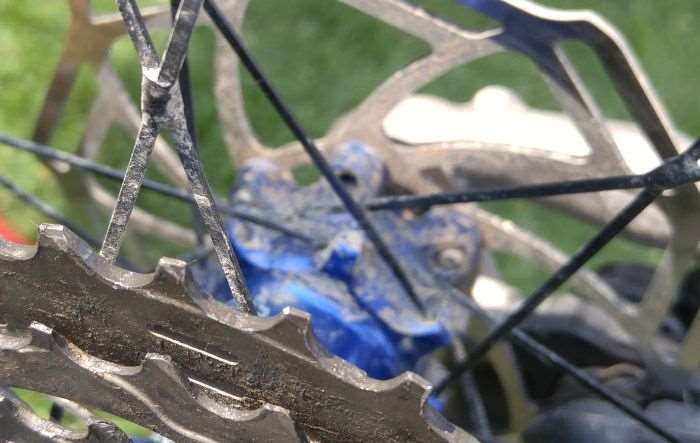 Chain: Shimano HG X11 11-speed. 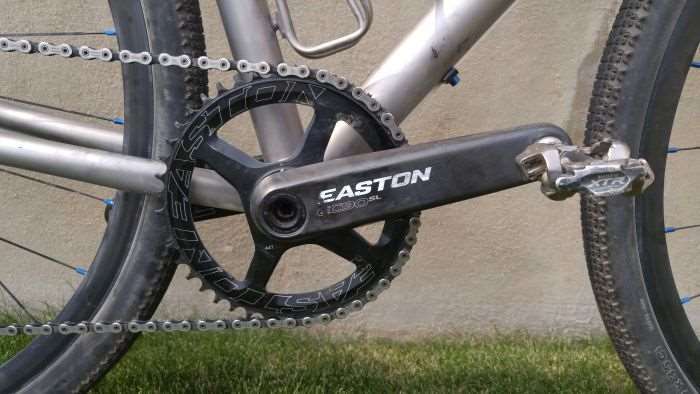 Crankset: Easton EC90 SL with 1X 44 tooth chainring. Wheelset: Tune Skyline road disc wheels with Skyline Prince and Princess hubs, tubeless. 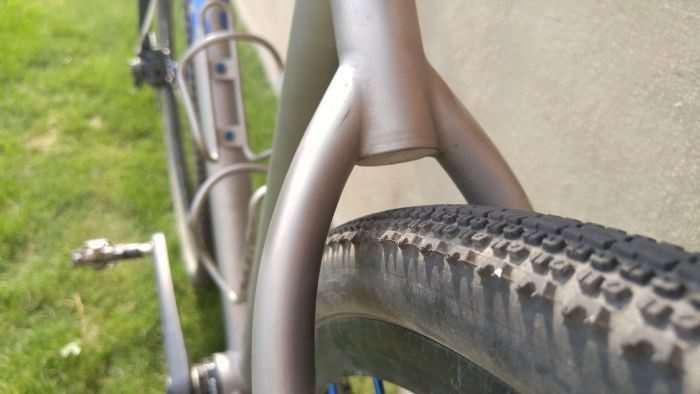 Tires: Kenda’s Flintridge Pro, 700c x 35mm. Seatpost: Tune Starkes Stück, 27.2mm. Bottle Cages: King Cage Titanium. 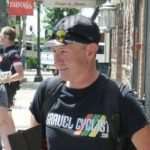 If you own a unique gravel bike you’d like to see featured on Gravel Cyclist, please contact us. All that gram chasing and he used a XTR 11-42 cassette? I wonder why he didn’t go with a SRAM XX1 10-42? 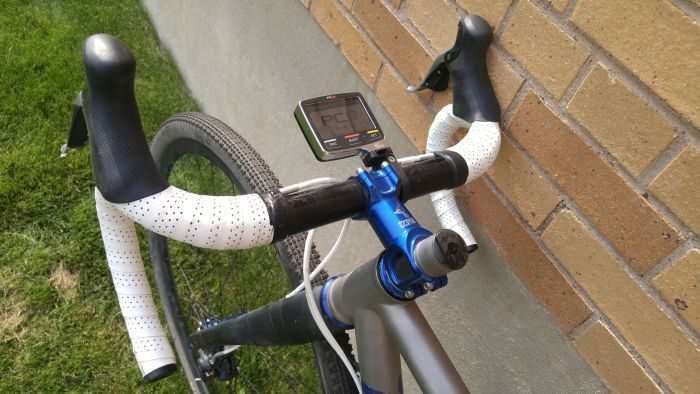 I use that set up with XTR di2 and it shifts perfectly. 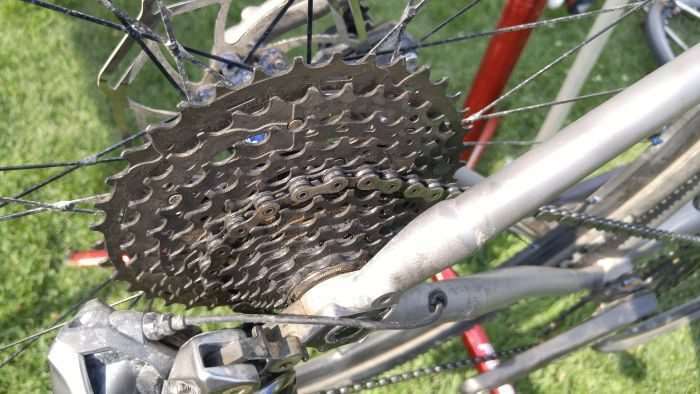 Joey, I’m not 100% up with everything SRAM, but that cassette requires the XD driver… perhaps the owner wanted to keep all of his wheels universally on Shimano 10 / 11? 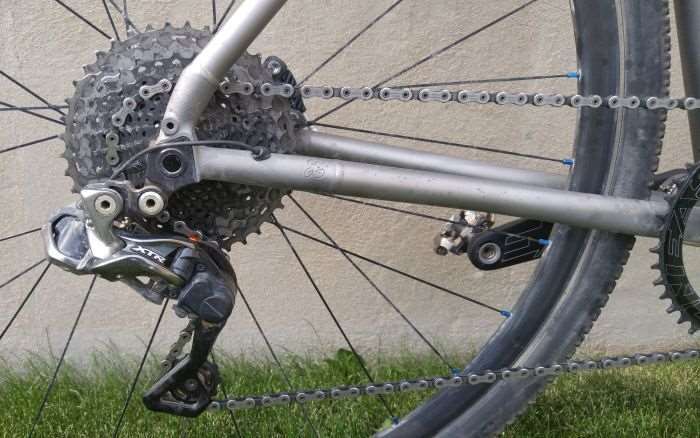 JG here- it is a 11-40 cassette, the sram might be lighter but the gear steps get pretty big! At home I run a 11-30 Dura Ace cassette. Reading this review, I feel like a recovered alcoholic, reading a review of some small batch bourbon whiskey (Pappy Van Winkle?). Confession — in my racing days of not too many years ago, I would have considered this a most reasonable bike. 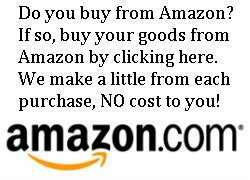 Especially if I could get some insider prices on the build and trinkets. So — I wont get too critical. I’ll limit my criticism to function. Light weight is OK – as long as function, reliability, etc aren’t compromised. Ignoring cost, here are some things I’d be concerned about. 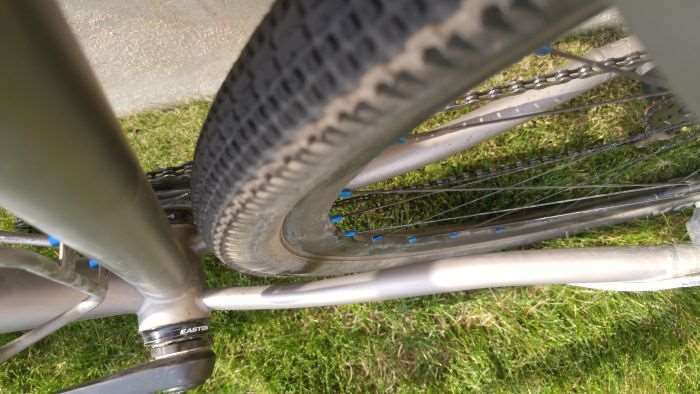 – Wheel build looks dicey and if you break a spoke — good luck fixing it on the road. – I’m not a big fan of 1x. 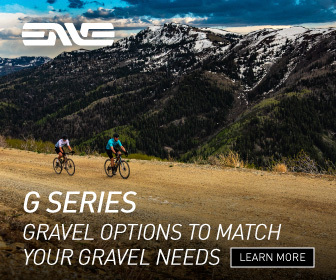 I know they are growing in popularity, and they do offer simplicity and weight savings; but I’ll stick with my 46/36 or 46/34 for my gravel bikes. – 140 mm rotors wont cut it on hilly rural NH dirt and gravel roads where I ride. – Internal hidden wires and doodads look great — if you have a full time pro mechanic to service your bike. I’m not sure how easy these will be to service if something breaks. That all being said, the truth is, when ever I see a new bike, the first thing I do is pick it up! In that regard, I’m sure I’d be very impressed with this bike. Who am I to criticize? The wheels are on the lighter side but like most things in life it’s is a risk/reward balance. I have to give it to Tune, almost 2000 miles off road and the wheels have not seen a spoke wrench! I go back and forth on 1x ………I really like it for CX racing, but for gravel/road you are either giving up gear range or gear step. 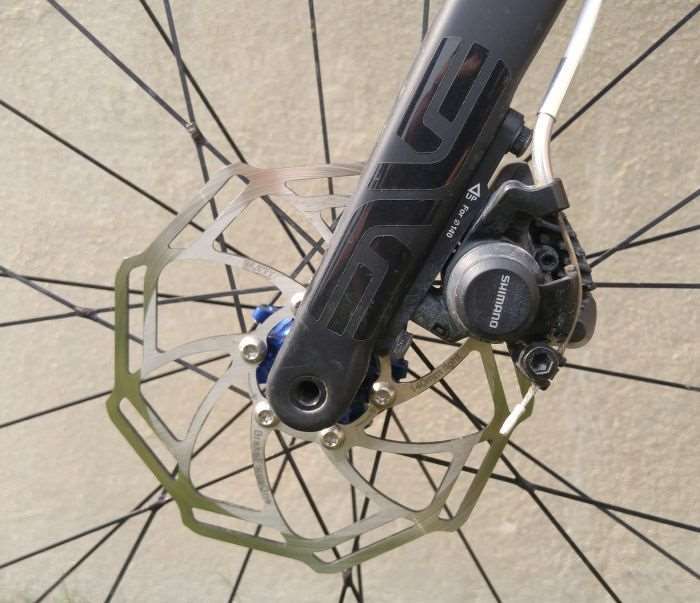 I think you would be surprised how powerful disc brakes are even with 140 rotors. In 6+ years on Di2 I have never had an issue with internal routing, mechanical shift cables are way more of a pain in the @ss! Jeremiah, I’m with you on Di2. I’ve been using it since the first 7970 10-speed Dura-Ace system appeared. Flawless for all generations. I like a little extra surface area myself with rotors, but to each their own! JG – thanks for taking the time to reply. Good answers to my concerns. Coming from a road racing background, I too used expensive wheels that were both light weight and durable. 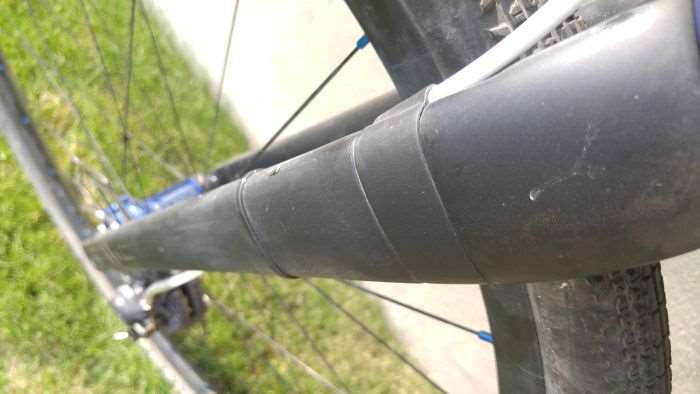 I have no experience with carbon spokes, but since the main cause of spoke failure is metal fatigue from the flexing of spokes, I suspect that carbon spokes have a much longer working life. I also admit to being less knowledgeable about discs. Frankly, I still prefer rim brakes. I’m using Paul’s Minimoto’s with HED Ardennes LT rims on my Ritchie Swiss Cross Canti. I’m switching to discs on my new gravel bike though. On the advice of my builder I’m reluctantly going with 160 rotors on 100/142 TA wheel set. My builder lives near me and rides the same roads I do. I’ll take his advice; but like you, I suspect this is overkill. 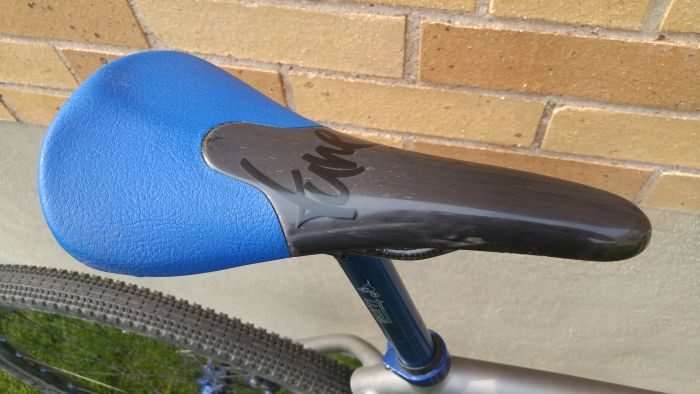 Larry, the ones I have seen can be tensioned to help prevent the seatpost slip… or, it also acts as a nice marker for seatpost height. Crap, bad call on my part… thanks Jeremiah, I will edit! 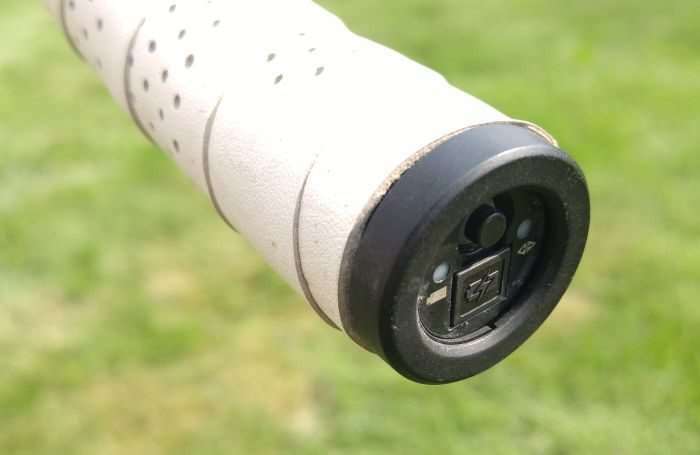 I am using one of those on my next personal build. 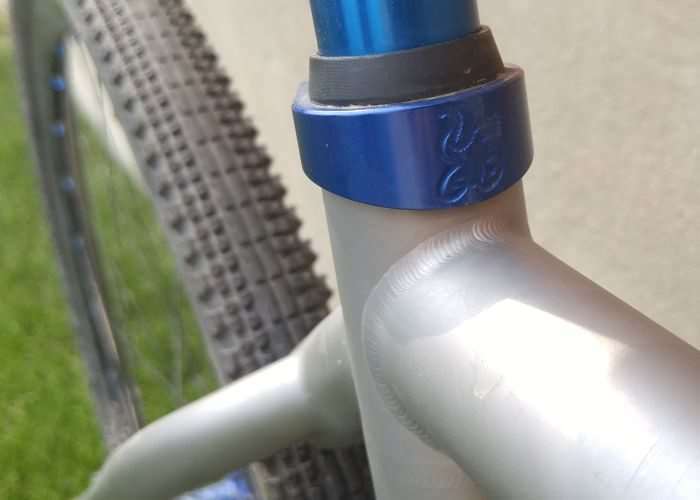 So we’re really going to acknowledge the “gram savings” of engraving logos, but not mention the inch+ of exposed steerer tube? Come on. Dude, Jeremiah may chop the steerer at some point. Relax. 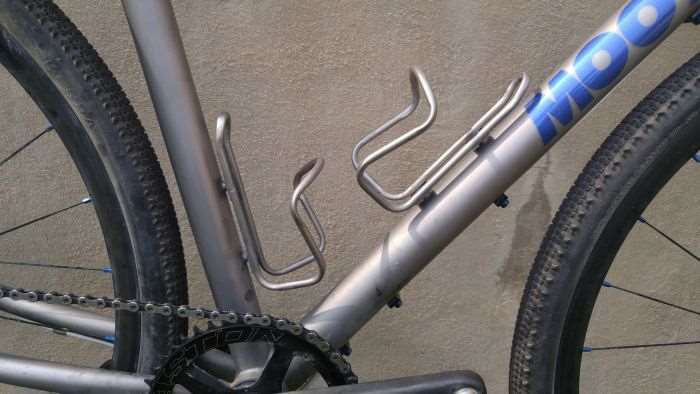 Meanwhile, the LAGG’s thinkin’ of building up an el cheapo SUPER UGLY monster cross from an old 26″ wheel Norco mtb frame. 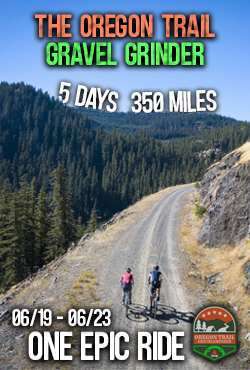 The mock-up was hideous…… I can’t wait to show for a gravel ride with the “BLING” bros!! Well written. I had the privilege to see this bike and it’s owner in action at the CX Waterloo races this weekend. An “aspirational” bike for sure which Huck rode with technical gusto.